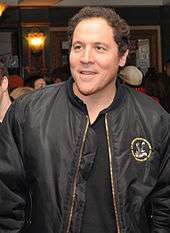 Jonathan Kolia "Jon" Favreau (/ˈfævroʊ/; born October 19, 1966) is an American actor, filmmaker and comedian. As an actor, he is known for roles in films such as Rudy, Swingers (which he also wrote), Very Bad Things, The Break-Up, and Chef (which he also directed). He has also directed the films Elf, Iron Man, Iron Man 2, Cowboys & Aliens, and The Jungle Book, and served as an executive producer on The Avengers, Iron Man 3, and Avengers: Age of Ultron. Favreau appeared as Pete Becker, Monica Geller's boyfriend during season three of the television sitcom Friends. He produces films under his banner Fairview Entertainment. The company has been credited as co-producers in most of Favreau's directorial ventures. Also in 2005, Favreau appeared as a guest judge and executive representative of Sony corporation in week five of NBC primetime reality TV business show, The Apprentice. He was called upon to judge the efforts of the show's two teams of contestants, who were assigned the task of designing and building a float to publicise his 2005 Sony Pictures movie, Zathura. Favreau was the third director attached to John Carter of Mars, the film adaptation of Edgar Rice Burroughs' swashbuckling space hero. While he did not ultimately direct it, he did have a cameo in the film, as a bookie. In 2013, he shot a pilot for a TV series based on the novel About a Boy, but set in San Francisco. He also directed the Destiny trailer "The Law of the Jungle" and the 2016 film The Jungle Book, for Walt Disney Pictures, which was released on April 15, 2016. In December 2015, Favreau stated that he and Harrison Ford are considering making a sequel of Cowboys & Aliens. However, Ford stated that he will likely make the sequel with Favreau after finishing his work in the Star Wars sequel trilogy. 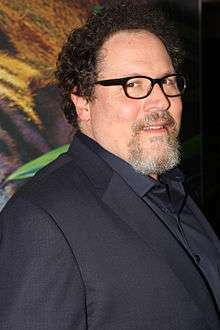 In April 2016, it was reported that Favreau will return to direct The Jungle Book 2, the sequel of his acclaimed The Jungle Book. Despite the fact that Warner Bros. is developing Jungle Book, it was reported that Favreau's film will premiere in August or November of 2018. The same month, it was revealed that Favreau will produce Avengers: Infinity War and its untitled sequel, along the Russo brothers. The two films will premiere on May 4, 2018 and on May 3, 2019. He also confirmed plans for make a sequel of Chef that month, featuring Indian cuisine. In September 2016, it was reported that Favreau will direct a live-action adaptation of Disney's The Lion King. In November 2012, it was said that Favreau was in talks to direct Star Wars: Episode VII - The Force Awakens, along with David Fincher, Matthew Vaughn and Ben Affleck; but J.J. Abrams was selected for direct the film. 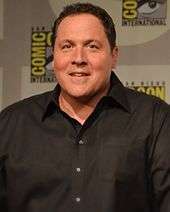 However, in June 2015, Favreau stated that although he would not be working on the Star Wars Anthology films, he could work on future Star Wars movies at some point. In December 2013, Will Ferrell stated that he didn't want to make a sequel to Favreau's Elf. During an interview in January 2016, Favreau stated that a sequel could possibly be made. The next month however, Ferrell reiterated that it's unlikely that the sequel will happen and that he still didn't want to return to the role. ↑ Jewel, Dan (November 25, 1996). "Swing and a Hit". People. vol. 46, #22. ↑ Marc Maron (December 14, 2012). "WTF – Jon Favreau talks heritage & pronunciation." – via YouTube. ↑ Ryan, James (October 13, 1996). "A Hollywood Scene He Knows Too Well". The New York Times. ↑ Pfefferman, Naomi (December 26, 2003). "A Gift From Santa's Jewish Helpers". JewishJournal.com. ↑ Stack, Peter (October 18, 1996). "Jon Favreau's `Swingers' -- It's a Guy Thing". The San Francisco Chronicle. ↑ "The Arty Semite". Forward.com blog. ↑ Austin, Ben (August 5, 2011). "Jon Favreau ('84) Succeeds Again With Cowboys & Aliens". The Bronx High School of Science Alumni Association & Endowment Fund. 1 2 Suter, Bob (Fall 2006). "Lighting Up the Arts: Extraordinary Queens College Alumni Who Have Gone on to Successful Careers in the Arts" (PDF). Q Magazine. Queens College. ↑ Bowles, Scott (May 7, 2010). "Favreau's a Comic-Book Hero"'. USA Today. pp. 1D-2D. ↑ Gillette, Amelie (March 7, 2006). "Jon Favreau". The A.V. Club. Retrieved March 14, 2016. ↑ Hayes, Britt (June 4, 2013). "See the Cast of 'Rudy' Then and Now". ScreenCrush. Retrieved March 14, 2016. ↑ Richardson, Seth (July 14, 2014). "'PCU' 20 Years Later: 5 Ways The Film Predicted The Future". The Daily Caller. Retrieved March 14, 2016. ↑ Rothman, Michael (July 5, 2014). "On 'Seinfeld's' 25th Anniversary: 25 Actors You Forgot Were on the Show". ABC News. Retrieved March 14, 2016. ↑ Buchanan, Kyle (August 17, 2011). "Nostalgia Fact-Check: How Does Swingers Hold Up?". Vulture. New York. Retrieved March 14, 2016. ↑ Dockterman, Eliana (December 29, 2014). "8 Actors Who Got Their Start on Friends". Time. Retrieved March 14, 2016. ↑ TV.com. "Tracey Takes On...". ↑ Travers, Peter (November 25, 1998). "Very Bad Things". Rolling Stone. Retrieved March 14, 2016. ↑ Angulo, Sandra P. (May 14, 1999). "Jon Favreau takes a swing at Rocky Marciano". Entertainment Weekly. Retrieved March 14, 2016. ↑ Costa, Maddy (22 September 2000). "Lots more Mr Nice Guy". The Guardian. Retrieved March 14, 2016. ↑ Sauter, Michael (December 1, 2000). "The Replacements". Entertainment Weekly. Retrieved March 14, 2016. ↑ VanDerWerff, Todd (August 11, 2010). "The Sopranos: "D-Girl"/"Full Leather Jacket"". The A.V. Club. Retrieved March 14, 2016. ↑ Ng, Philiana (March 13, 2011). "'Undeclared' Creator Judd Apatow: It Was a Weird Moment for Comedy". The Hollywood Reporter. Retrieved March 14, 2016. ↑ McNary, Dave (February 22, 2002). "Daredevil has partner in Favreau". Variety. Retrieved March 14, 2016. ↑ "The Big Empty (2003)". The New York Times. Retrieved March 14, 2016. ↑ Giroux, Jack (May 12, 2014). "How Jon Favreau Made "Chef" His Own Flavor of Ice Cream". Film School Rejects. Retrieved March 14, 2016. ↑ Foundas, Scott (December 4, 2003). "Review: 'Something's Gotta Give'". Variety. Retrieved March 14, 2016. ↑ "Vince Vaughn's Wild West Comedy Show: 30 Days & 30 Nights -- Hollywood To The Heartland". TV Guide. ↑ "Lost in Space". January 1, 2000 – via IMDb. ↑ Kit, Borys (April 28, 2006). "Marvel Studios outlines slew of superhero titles". Hollywood Reporter. Archived from the original on May 13, 2006. Retrieved April 29, 2006. ↑ Yamato, Jen (May 1, 2008). "Iron Man is the Best-Reviewed Movie of 2008!". Rotten Tomatoes. Retrieved August 16, 2010. ↑ "Iron Man (2008)". Box Office Mojo. Retrieved August 16, 2010. ↑ Adams, Sam (April 14, 2016). "Assessment of Jon Favreau's directing career from Iron Man to Chef to Jungle Book". Slate. ↑ "Behind the Scenes of Iron Man with Director Jon Favreau". ↑ Finke, Nikki (July 9, 2008). "So What Was All The Fuss About? Marvel Locks in Jon Favreau For 'Iron Man 2'". Deadline.com. Archived from the original on August 21, 2012. Retrieved August 3, 2012. ↑ "Trio of Ladies Going on Couples Retreat". TV Guide. October 15, 2008. Retrieved on October 15, 2008. ↑ Joseph (February 27, 2014). "10 Actors You Didn't Realise Were In Star Wars: The Clone Wars". What Culture. ↑ Sneider, Jeff (December 14, 2010). "No Favreau? 10 Directors Who Could Take Over 'Iron Man 3'", TheWrap.com. WebCitation archive. ↑ "Jon Favreau Will Not Direct Iron Man 3". "Vulture" (column). New York. December 14, 2010. Retrieved on December 14, 2010. ↑ Behind the Scenes with Jon Favreau. YouTube. BrandonJLa. July 23, 2011. ↑ Bettinger, Brendan (February 8, 2012). "Jon Favreau to Direct NBC Pilot REVOLUTION; J.J. Abrams, Eric Kripke, and Bryan Burk Producing". Collider. ↑ "NBC Pilot Filmed in San Francisco". Nbcbayarea.com. 2013-03-28. Retrieved 2014-07-19. ↑ "Disney Sets Release Dates for Alice in Wonderland 2 and The Jungle Book". comingsoon.net. Retrieved 16 March 2014. ↑ "Favreau Asks Ford about 'Cowboys & Aliens' Sequel, Ford's Reaction is Priceless". ↑ "Disney Stakes Out Release Dates for 'Jungle Book 2,' 'Maleficent 2' and More". ↑ Lang, Brent (April 25, 2016). "Disney Claims Dates for Several New Movies; Confirms 'Jungle Book 2,' 'Mary Poppins' Sequel". ↑ "The Jungle Book's Jon Favreau IS going back to Marvel". April 18, 2016. ↑ "Indian food in Jon Favreau's Chef 2?". t2online.com. ↑ "Disney and Jon Favreau Joining Forces on "The Lion King" - The Walt Disney Company". September 28, 2016. ↑ "Jon Favreau on Twitter". ↑ Graser, Marc (November 11, 2010). "Jon Favreau enters Disney's 'Magic Kingdom'". ↑ "Pixar is Helping with Jon Favreau's 'Magic Kingdom' - CraveOnline". July 25, 2012. ↑ "Is Jon Favreau Still Making Magic Kingdom At Disney? Here's What He Says - CINEMABLEND". April 5, 2016. ↑ "Jon Favreau Still Wants To Do 'Magic Kingdom'; Could Be After 'Jungle Book' - /Film". March 10, 2014. ↑ "'Star Wars 7′: David Fincher, Jon Favreau Being Considered to Direct?". November 30, 2012. ↑ "Jon Favreau Confirms He's Not Directing a 'Star Wars' Movie". June 19, 2015. ↑ "Will Ferrell Says 'Bah Humbug' to 'Elf 2'". ↑ "Elf 2 Could Happen Says Jon Favreau (Exclusive)". ↑ Tilly, Chris (February 11, 2016). "Why Will Ferrell Won't Make Elf 2". ↑ Len Tillem Program (On air discussion). KGO radio, San Francisco. December 29, 2008. ↑ Boucher, Geoff (May 5, 2008). "Jon Favreau is the action figure behind 'Iron Man'". Los Angeles Times. Archived from the original on May 17, 2008. Retrieved May 17, 2008.